All photos via grandpadr47's eBay listing here. I don’t know if this 1996 Cadillac Fleetwood hearse that’s been converted into an RV is someone just making do with what they have or a move so goth, Andrew Eldritch would sneer at it in disdain. All I know is this Caddy for sale on eBay is the most wonderful weird car I’ve seen for sale in a long time. 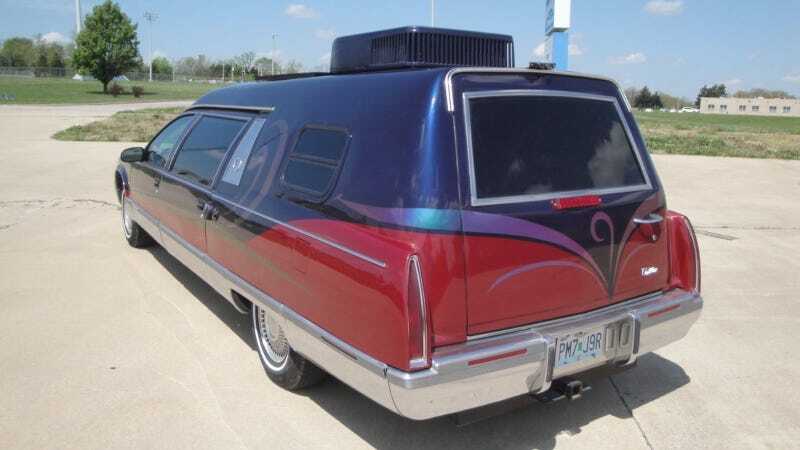 The eBay seller says it was only converted 2.5 years ago into a Class B motorhome, so you know that if this saw regular hearse duty, there had to be bodies hauled back where you’re sleeping, pooping and doing regular RV stuff like watching TV or hauling stuff to make smores. You even get cupholders back there. Cozy! For what it’s worth, some less obvious vehicles get roped into funeral home body-hauler duty nowadays, too, so who even knows what’s been in the back of that used Dodge Caravan? Just savor that fact the next time you look for a used minivan or other vehicle that has ample rear space when you remove its rear seats. But this is a hearse, so it screams “there have probably been dead bodies back here” to anyone who would look at it. Its darker take on an RV-style paint job and extra little windows can’t hide that. It’s all but guaranteed to weird the hell out of the normals. It’s even on white walls! The “RV” conversion is pretty simple, without a lot of the ornamental flourishes you might find inside a still-in-duty hearse. There’s a bed for two where you’d usually stick a coffin. The world’s least private porta-potty sits in front of it, where the rear footwell would be if you’d have left this car a basic Fleetwood. While you may have to tell everyone else to leave the hearse to use said toilet if you want any privacy, at least it should be comfortable back there. The hearse/RV has a 9200-BTU air conditioning unit in the rear, plus a 100-watt solar panel to help power the aircon and other accessories. Cons: Everybody has to leave the car for you to get any privacy. 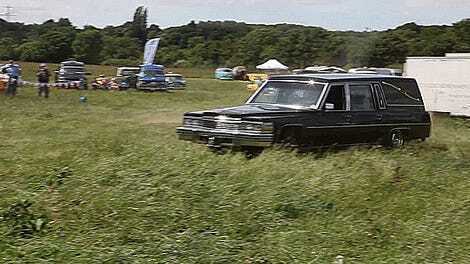 Pros: You’ve got the whole hearse to yourself—just you and your number two. While I wouldn’t call a Fleetwood-based vehicle anything more than “soft” and “pillowy,” that big LT1 V8 engine and soft ride probably makes this a comfortable highway cruiser. The seller says it gets about 17.7 mpg doing 75-80 mph interstate speeds, which is not bad. Plus, Fleetwood-based vehicles have some decent tow capacity, and this one even comes with a tow hitch receiver. That’s good, because there’s not a ton of extra space inside unless you want to pile your bags on top of the bed the whole way. Style! Class! Room for the dearly departed, or not! Only problem: it’s not exactly cheap. It’s up for $12,000 right now, with a big “Reserve not met” warning on the listing. RVs, hearses and luxury cars are some of the most highly depreciated vehicles on the planet, so you might think this unholy trifecta of brougham win would fit that trend, but nope. It is a relatively low-mileage example, though, as the listing claims it only has 79,000 miles. Plus, you will win at (very morbid) life on style points, so it may be worth it. The seller notes, “If you don’t like being noticed, you don’t want this RV.” Expect to explain why you’re sleeping in a hearse a lot, because I’m really fascinated by this. You’re sleeping in a hearse? That rules.